Does Bissell Powerglide Live Up To Expectations? Bissell Powerglide is a cordless, bagless upright pet vacuum cleaner characterized by great versatility. While you can use it on bare floors and carpets like any other upright vacuum, its Lift Off canister lets you quickly transform it into a stick vacuum and easily remove pet hair and dirt from stairs, upholstery, and even your car. As its name suggests, this vacuum is manufactured by Bissell, a renowned US company that has been revolutionizing the way Americans clean their homes for more than 140 years. Find out if this multi-surface pet vacuum cleaner has what it takes to satisfy your cleaning needs in this thoroughly researched Bissell Powerglide review. A lively disco teal color combined with a stylish, slender design makes Bissell Powerglide pleasing to the eye. Due to its lightness and great maneuverability enhanced by the presence of a swiveling head, this vacuum is perfectly easy to use and navigate. As a cordless, bagless upright with a lift-away canister, Bissell Powerglide is a portable vacuuming solution that can be used to clean a multitude of surfaces in your home, including those hard-to-reach areas. The power and brush switches are conveniently placed and the soft bumper prevents potential damage to walls and furniture, which makes vacuuming even more effortless. If you do not have much storage space, there is no need to worry because this pet vacuum cleaner takes up very little room. The only issue we have with Bissell Powerglide’s design is its rather short hose that limits the vacuum’s cleaning reach. So far in this Bissell Powerglide review, we have mentioned a couple of prominent qualities of this vacuum, including its versatility, maneuverability, and lightness. In this section, we will provide a more detailed overview of its useful features that shape your vacuuming experience. With dual-cyclone technology, the vacuum sends the dirt and hair directly into the dirt canister, preventing obstructions of fast-spiraling airflow and allowing for steady, edge-to-edge suction. The highly useful Lift Off technology lets you remove the dirt canister and motor from the body of the vacuum and use the device as a stick model while vacuuming stairs and more remote areas. The power brush on/off switch combined with the Lift Off technology greatly facilitates room-to-room cleaning and transitioning to different surfaces. With the switch of a button, you can move from hard floors to carpets and vice versa. Likewise, the lift-away canister lets you quickly transition from floors to above-floor surfaces and staircases. One of the most prominent features of Bissell Powerglide, swivel steering makes this vacuum cleaner perfect for vacuuming in high-traffic, crowded parts of your home. The swiveling head easily deals with bends and turns and leaves no corner unvacuumed. With this handy feature, Bissell Powerglide takes the guesswork out of height adjustment and automatically conforms to carpets of different types and depths. With the easily detachable bottom-release dirt cup, emptying the canister is quick and simple. You just need to hold it over a trash can, press the release button, and empty the content into the trash. The accessory pack that comes with Bissell Powerglide is far from impressive. It only includes a much-needed extension wand and a 2-in-1 accessory that functions both as a crevice tool and a dusting brush tool. The extension wand is highly useful in vacuuming above-floor surfaces as it can nearly double the vacuum’s reach. However, due to the length of the hose, even with the extended cleaning reach, you may not be able to effortlessly clean ceiling fans. The 2-in-1 crevice and dusting brush tool is perfect for cleaning narrow spaces as well as upholstery, stairs, car interiors, and all kinds of hair-filled cracks and crevices. As a fully assembled upright, Bissell Powerglide delivers great results on bare floors and carpets. When transformed into a stick model, with the canister and motor detached, it is easier to use on furniture, stairs, and car interiors. 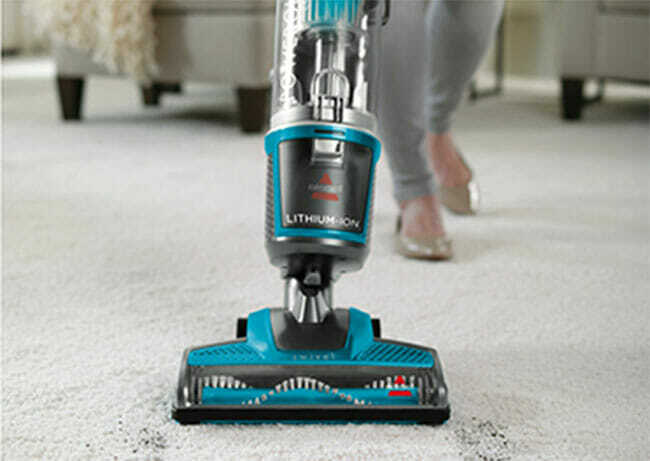 In this section of our Bissell Powerglide review, we will focus on the vacuum’s performance on each of the surfaces for which it is suitable. Bissell Powerglide definitely provides the best results on bare floors of all types and it is safe to use on high-quality hardwood floors. There is no undesired scattering and no variation in suction. The narrow cleaning path may require a larger number of passes, but in comparison to similar uprights, the difference is not great. The vacuum easily collects both pet hair and fine particles while larger particles may require an extra pass or two. Make sure the power brush is turned off when you are vacuuming bare floors to prevent potential damage and scattering. On carpets, Bissell Powerglide removes pet hair and dirt with varying success, depending on pile height. It is not perfect for shag rugs, as it may not fully remove deep-embedded dirt, although it generally works wonderfully in terms of pet hair removal. Its performance on low-pile carpets is stellar. If you need to pick up pet hair from upholstery, Bissell Powerglide can be of great help. The 2-in-1 tool does a great job at removing hair and fine dust particles from creases and crevices in the material. However, the tool’s small dimensions may not allow you to quickly finish vacuuming. Bissell Powerglide’s performance on carpeted stairs is just as good as on low-pile carpets. The 2-in-1 tool can be used to deal with folds and edges. The Lift Off canister lets you easily move from one step to the other and vacuum the entire staircase with ease. Due to the length of the body, this vacuum is not ideal for vacuuming car interiors, especially in comparison to hand-held vacuums. However, that does not mean that it cannot be of use; it just requires a bit more maneuvering effort. The 2-in-1 tool can come in handy and you can be sure that pet hair will be swiftly removed, although the same may not be true for larger particles like mud. Bissell Powerglide is relatively reasonably priced at $199.99. Included in the package are the essential vacuum components, the 2-in-1 accessory tool, the extension wand, the battery, and the charging base. The vacuum comes with free standard shipping throughout the US. The manufacturer offers a 2-year limited warranty that covers defects and malfunctions that are not caused by improper use and maintenance. Belts, filters, brushes, and other routine replacement components are not covered. The vacuum also comes with a 30-day money-back guarantee. If you are not satisfied, you can return the device complete with manuals and accessories and receive a full refund, minus a $4.95 return shipping fee. Most users of Bissell Powerglide love its appealing design, its lightness, its quietness, and its maneuverability. It is often praised for its powerful suction and excellent performance on bare floors, low-pile carpets, edges, and crevices. Many find it to be just as convenient as a hand-held when it comes to stair vacuuming. Furthermore, it has proved to be highly durable and it is easier to clean and maintain than a number of its competitors. However, a number of users have pointed out that clogging can be an issue and that the hose is shorter than optimal. Some users are also unhappy about the lack of a HEPA filter. The least common complaint refers to unsatisfactory suction power, which is an assessment most users disagree with. Nonetheless, it can be argued that the comments about suction power deficiency may be based on the vacuum’s varying performance on carpets of different pile height. Based on the general user opinion and our impressions, we can conclude that Bissell Powerglide does live up to expectations since most users find it to be powerful and efficient in hair and dirt removal, negative comments are far from prevalent, and users rarely report having major issues with the appliance. Our research for this Bissell Powerglide review has revealed 3 major advantages of this pet vacuum cleaner. It is light, easy to maneuver, and great at removing pet hair from different surfaces. Furthermore, its Lift Off dust canister is easy to empty, which is a significant upside if you vacuum often. Keeping these qualities in mind, we most warmly recommend it to individuals who live with more than one pet and need to vacuum on a near-daily basis. Our ratings are the result of an objective and independent evaluation of Bissell Powerglide, generating the final rating that reflects the overall quality of the company. Ratings may change as the service changes. Bissell Powerglide user rating based on 3 user reviews. Been using it for over a year, still as powerful as when I bought it. I have 2 kitties and it is perfect for vacuuming litter and pet hair. I just don’t think it’s good for shag rugs, I think it says so in the review as well, the brush doesn’t seem to be built for them. It really works great when it comes to pet hair, but I don’t understand why it was too much of a trouble to make an 8-foot instead of a 6-foot hose. It’s not like they could not afford a longer hose and it would make the vacuum so much better. Light, powerful, easy to store. I live in a small apartment with too much stuff, so I like that it’s easy to vacuum in-between and underneath the furniture (my cat likes to sleep under the sofa), so I don’t have to move everything around every time I vacuum. We found 0 verified Bissell Powerglide discounts for April, 2019. There are no Bissell Powerglide coupons or discounts right now. If you like Bissell Powerglide but aren’t sure whether they are truly the ideal choice for you, you may want to take a look at our comparisons below to discover if one of their competitors is more suitable for you.